© Marie LoParco, "Phoenix Rising", mixed media painting, 12" x 36", All Rights Reserved 2017. Sold. 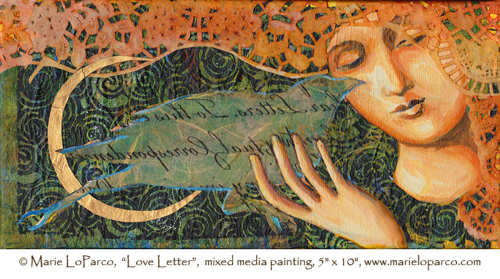 ©Marie LoParco, "Love Letter," mixed media painting. 5" x 10" original sold. All right reserved 2017. Sold. 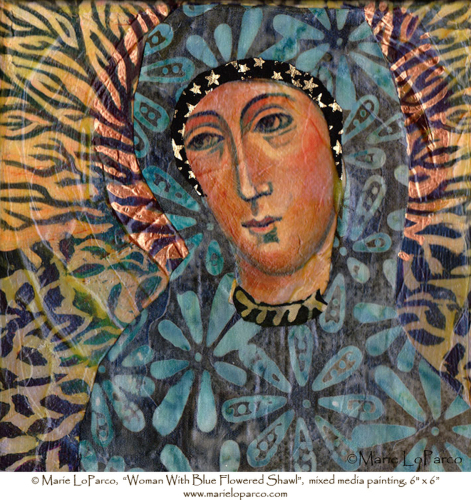 ©Marie LoParco, "Our Lady of the Stars," mixed media painting. All right reserved 2017. 15" x 30. " Sold. 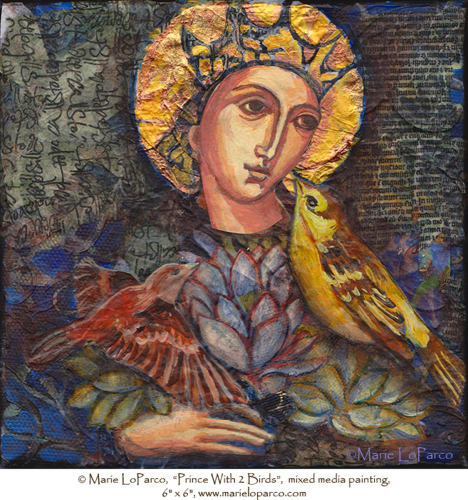 © Marie LoParco"Woman Meditating"mixed media painting, of a woman meditating holding a flower and bird, 6" x 6", All Rights Reserved 2017. Sold. 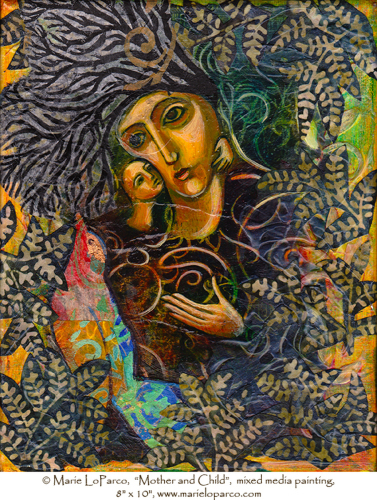 © Marie LoParco, "Mother and Child", mixed media painting, 10" x 8"", All Rights Reserved 2017. Sold. 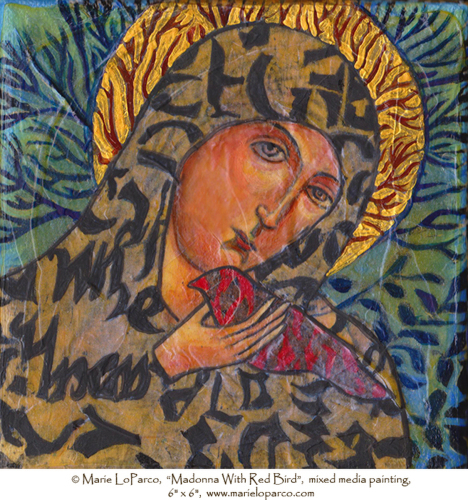 © Marie LoParco,”Madonna With Red Bird”, mixed media painting, 6" x 6", All Rights Reserved 2017. Sold. © Marie LoParco, "Standing With the Moon", mixed media painting, 8" x 10", All Rights Reserved 2017. Sold. 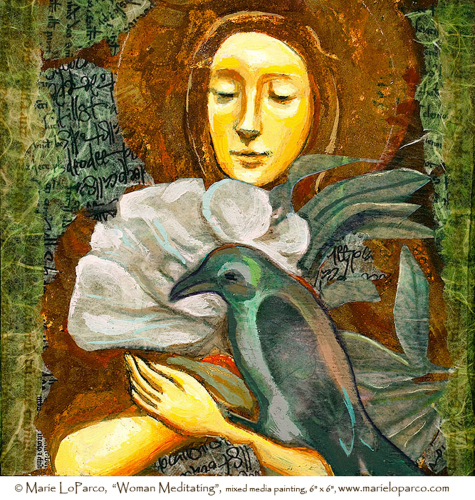 © Marie LoParco"Crow Maiden"mixed media painting, 5" X 10"All Rights Reserved 2017. Sold. 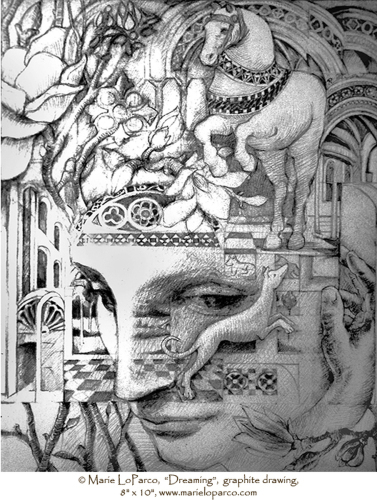 © Marie LoParco, “Dreaming”, graphite drawing, All Rights Reserved 2017. Sold. ©Marie LoParco, "Tree of Life," mixed media painting, 24" x 48", All Rights Reserved 2017. Sold. ©Marie LoParco, “ The Call” 5" x 10" original sold. All rights reserved 2017. © Marie LoParco, "Surrounded By Branches", mixed media painting, 8" x 10", All Rights Reserved 2017. Sold. 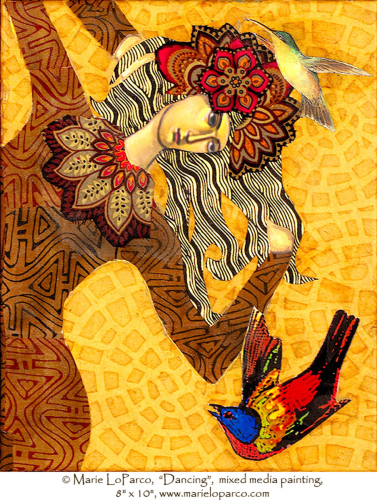 © Marie LoParco "Woman With Golden Flower" mixed media painting, 5" x 10". All Rights Reserved 2016. Original painting sold. Archival prints are available for purchase at Etsy.com/shop/marieloparco. 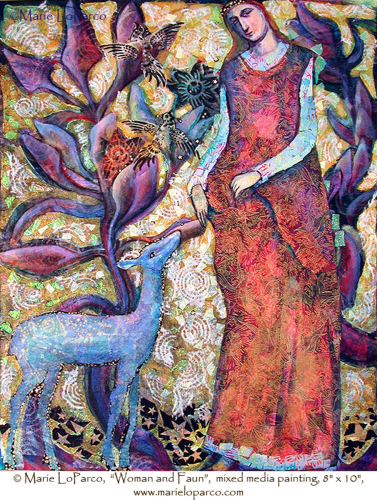 © Marie LoParco," Woman With Fawn", mixed media painting, 24" x 36", All Rights Reserved 2016. Original sold. © Marie LoParco, "Prince With Two Birds", mixed media painting, 6" x 6", All Rights Reserved 2016. The original painting has been sold, however, archival prints are available for purchase. ©Marie LoParco, " Messages," mixed media painting. 5" x 10" original and archival prints are available for purchase. All rights reserved 2016. 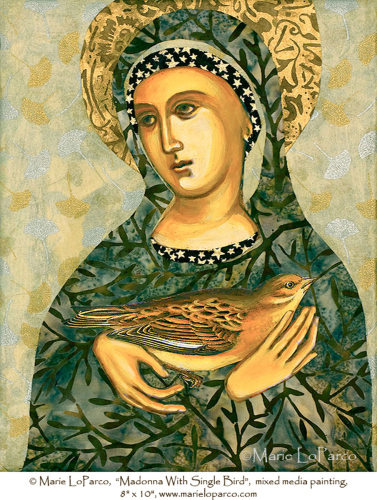 ©Marie LoParco, "Madonna with Single Bird", mixed media painting, All Rights Reserved 2016. Original painting sold, 8" x10" archival prints are available for purchase. ©Marie LoParco, " Listening" mixed media painting. All right reserved 2016. The original is sold but 6" x 6" archival prints are available for purchase. 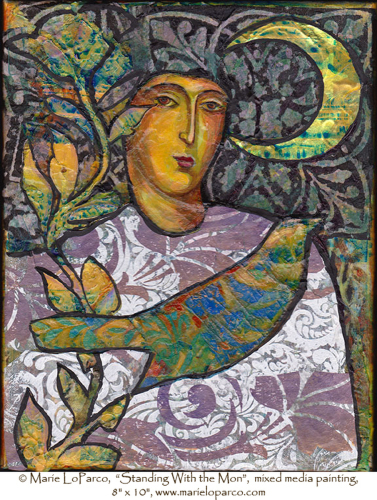 ©Marie LoParco, “Quan Yin”, mixed media painting on canvas 18" x 48", All Rights Reserved 2016. Original painting sold, 5" x 16" archival prints are available for purchase. 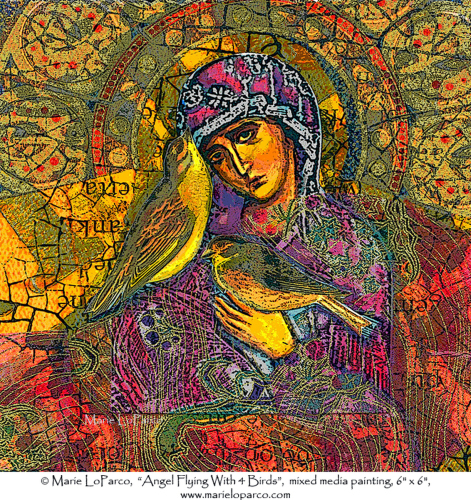 © Marie LoParco, “Madonna with Two Birds”, mixed media painting, 6" x 6", All Rights Reserved 2016 Original sold, archival prints available for purchase. ©Marie LoParco, "Moment of Awareness" mixed media painting. 5" x 10" original sold. Prints on archival Velvet Fine Art Paper and with Ultrachrome K3 state-of-the-art archival pigment inks inks available for purchase. 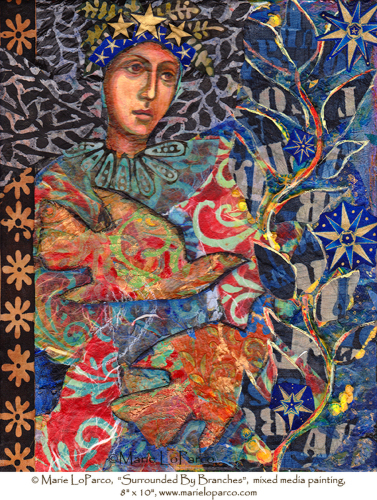 v©©Marie LoParco, “Woman With The Blue Deer”, mixed media painting on canvas 12" x 36", All Rights Reserved 2016. Original painting sold, archival prints 5" x 16" are available for purchase. 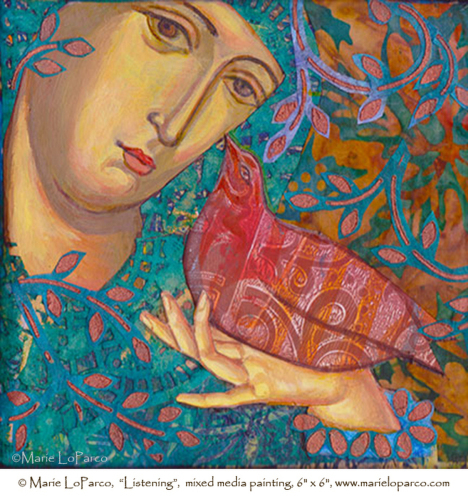 ©Marie LoParco, “ Girl and Hen” 6" x 12" original and archival prints are available for purchase.